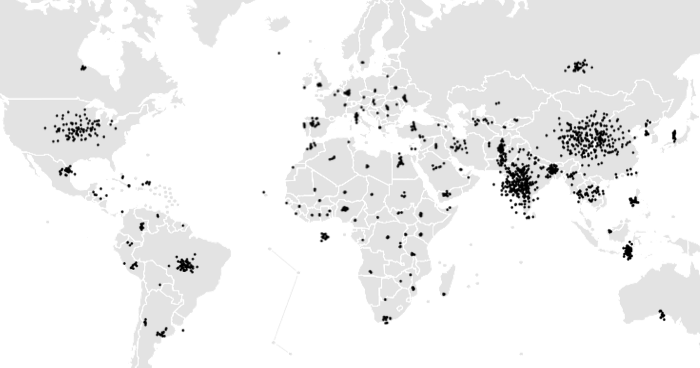 In the following visualization, n=1500 agents were sampled at random from the world population and their latitude/longitude was plotted. Country outlines were composited to provide context. If you choose to use live API data, this will result in your simulations using different agent data each time. Presently, it is recommended that you simply download PplApi.java and put it in your MASON project. MASON also requires additional Java libraries from the Apache Foundation In order to function. See Installing Java Libraries for more information. The following example code is an extension of the MASON SchoolYard tutorial. The example will request 500 agents from pplapi and add them to our simulated world. In order to connect your MASON simulation to the pplapi.com API, it is helpful to make use of the Apache Foundation’s HTTP and CSV libraries. This section provides some information to get you started. Download the Apache Commons CSV .jar here. commons-csv-1.2-bin.zip or later is recommended. Unzip the archive and install it to your CLASSPATH. Download the Apache HTTP Components .jar here. 4.5.1.zip or later is recommended.